Jerry Bartruff makes his budget presentation. 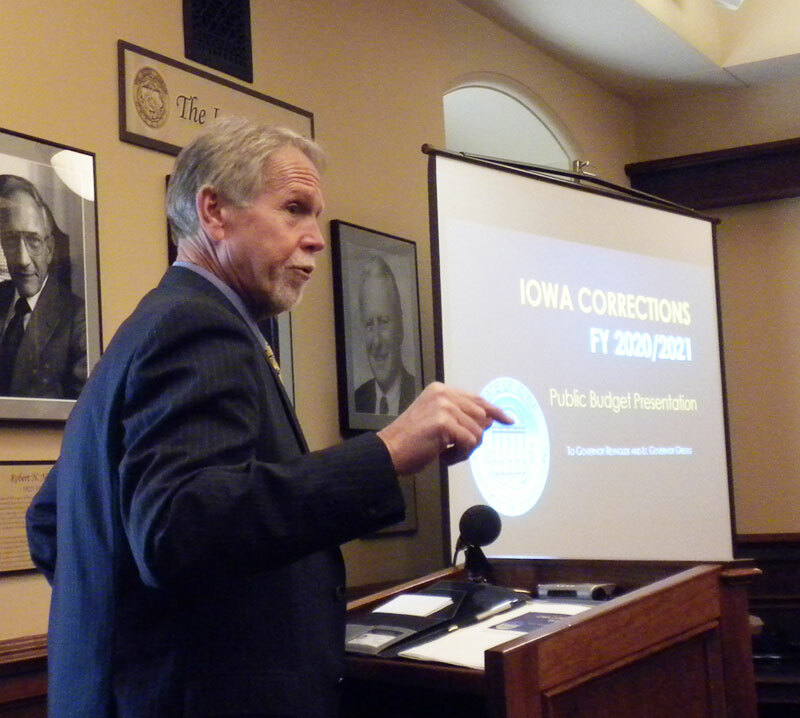 The head of the Iowa Department of Corrections announced Monday that he will retire at the end of December. Jerry Bartruff made the announcement at the end of his budget presentation to the governor. Bartruff is calling for a budget that is about the same as last year. “We know that we have some things that we are proud of. We know we’ve got some things that we need to do something about and we need to have a plan,” Bartruff says. Bartruff says one of the positives is a drop in attacks by prisoners. “If you look at FY ’16 there are over 140 incidents of either staff having a substance thrown at them, a serious injury. The trend has dropped the last three years — so as you can see in F-Y ’18 there are only eight serious assaults on staff,” Bartruff says. He the serious assaults mostly occurred at the State Penitentiary where the worst prisoners are housed. The rate for prisoners committing another crime has gone from 29.7 percent in the 2011 to 2014 fiscal years to 37.8 percent in the 2015 to 2018 fiscal years. After the hearing Bartruff told reporters that they have been trying to get more treatment when they can. He says providing enough treatment isn’t the only answer. “It’s also making sure that we don’t keep people locked up any more longer than necessary. There is some data that suggests the longer you keep people in prison without reintegrating them into the community — the likelihood of them recidivating increases. So its’ a myriad of factors,” Bartruff says. The Corrections Department Budget last year was roughly 450-million dollars. There are 7,739 men in prison and 730 women. The number of men went up by 100 in the last fiscal year, while the number of women dropped by nine.